The Christmas spirit won over the weather and Otaki’s Main Street Christmas Festival went ahead as planned, even though some events were moved indoors. The golden elm tree in Memorial park had been “bombed” with its brightly coloured new “skin” of knitted many colours. All the organisers were ready, but the unseasonable weather brought rain into the early afternoon, so the entertainers moved indoors at the Memorial Hall. Master of Ceremonies, Graham Rikihana’s music station was set-up on the stage ready for the entertainers to take to the stage. Otaki’s talented youngsters demonstrated their singing skills, along with the women singers who sang together and individually. The older generation took to the floor, with the Kori Kaumatua Flash Mob Dancers, aged from 40’s to 80 plus, showing it’s not just the young who know how to dance! They received great cheers and lots of applause. While the Otaki Volunteer Fire Brigade’s vintage engine made an appearance, it was a very “mod” Father Christmas present, speaking and handing out sweets from his extra height atop a pair of high stilts! The younger children were a trifle bemused by this modern day Santa. 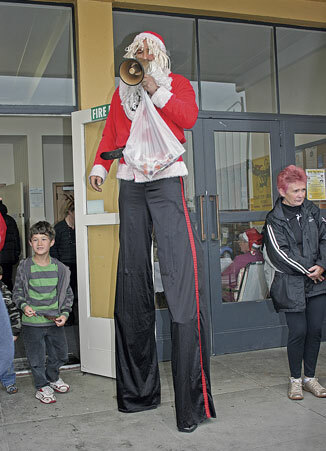 “Having Father Christmas on stilts was certainly different, we must have some very tall chimneys in Otaki!” she said. She gave special thanks to Mr Rikihana for putting together the programme, the band and all the singers, who had been preparing for weeks.